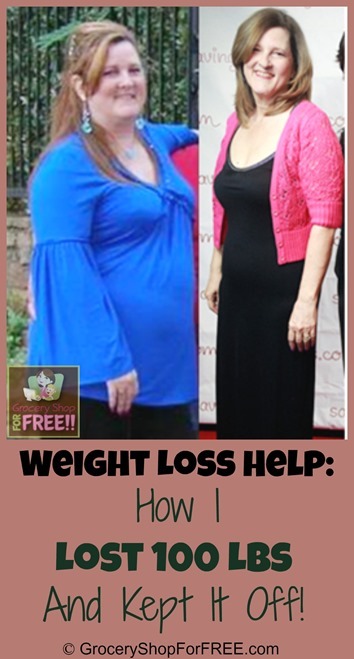 You are here: Home / Weight Loss / Weight Loss Help: How I Lost 100 Lbs And Kept It Off! I wanted to help you start the New Year off with some Weight Loss Help! I am going to share with you a few of the tips I found that worked for me and How I Lost 100 Lbs and Kept It Off for about 5 years, now. So, with the New Year comes plans to make changes. Changes to our lives and lifestyles. Have you made any resolutions? Maybe to lose weight, get in shape, save money, earn more money, get organized? Y’all know that 5 years ago I had a bout with Type II Diabetes – which I no longer have, Thank God! But, I lost over 100 lbs and have kept it off. I have researched and changed a lot of my eating habits and still adjust them even now to add or remove things as I notice my weight change or the way I feel change. I found a few things that helped me – whether real or in my mind! Hey, mind over matter, right? I thought I might share them with you, in case they might help anyone else. I have people ask me all of the time how I lost the weight. I tell them by eating 1 portion instead of 3! lol Which is true – if you started reading portion sizes and only eating 1 portion size you would be surprised at how the weight would fall off! Remember, I WON’T exercise – so, I lost the weight without doing ANY exercise. Here’s why: I KNEW I would never continue on any kind of exercise regime if I started it. So, the weight loss wouldn’t “stick”. I had to find what worked for me. That is the second thing I tell people who ask me how I lost it – you HAVE to find what works for you! It can’t be anyone else’s weight loss path – it has to make sense to you and work for you FOR LIFE! We hear that it HAS to be a lifestyle change and that sounds so daunting and hard that we can’t do it and maintain it. Again, it HAS to be what works for you! What works for me: No exercise – that was #1! lol Also, due to the fact I had just been told I had Type II Diabetes and I didn’t want it – I had to cut out things that affected that. So, I cut out almost all sugar – I drink 1 teaspoon of sugar in my coffee every morning – I used to use 4!! I was able to slowly cut back and now if I accidentally put a little more in it – it is awful! Funny how that works. I also cut out almost ALL carbs! Oh that was a killer for me! I could potatoes – fried, mashed, baked, run over with a car! It didn’t matter – I would eat instant mashed potatoes with almost every meal, too! But, I haven’t had a potato in a couple of years now and I survived and honestly do NOT feel like I am deprived at all. Again, I HAD to find what worked for me. As I began to lose the weight – I stopped having reflux – I would jump up in the middle of the night with reflux so bad I thought I was going to choke in my sleep! My husband told me I stopped snoring, I had more energy, of course – my knees didn’t hurt as much when climbing stairs, I didn’t get out of breath – so many things you just don’t connect with your weight. I mean yes, we all know that weight will do that – but, we don’t really connect it to US and OUR weight! Side Note: I stopped drinking soda from cans – “they say” the aluminum gathers in a certain area of your brain and it increases your chance of Alzheimer’s. When counting carbs – on the Nutritional panel you can subtract the Fiber content from the Carbs to get the actual carb count. Your brain signals your stomach when it’s hungry if it SMELLS something good. So, always stop and consciously determine if you are really hungry or if it just smells good. think about it next time you pass a donut shop or someone baking bread. You will say, “Oh, I am so hungry!” But, really stop and think to yourself and see if you actually feel hungry or if it’s just your brain telling you that because you smelled it! If you wait a few minutes after you feel hunger pangs they will go away for about 30 – 45 minutes – and nothing disastrous happens! lol That’s not to starve yourself but, know that you don’t have to have a snack an hour before a meal, just because you “feel” hungry. I pay attention to when my stomach feels full and stop when it is “comfortably full”. I used to overstuff and be in pain and not realize it was because I had eaten too much! Moderation – in all areas of life. Eating, drinking, everything – if we could have self control in the way we behave in all areas – life would be easier! Dr. Oz says your waist needs to be 1/2 of your height in inches or less. He also says that it doesn’t matter if your “rear” is ginormous or your chest – it’s all about your waist because the Belly Fat presses on your organs and makes it hard for them to work correctly – that’s one thing that causes Type II Diabetes, too. So, this is just my little talk about how I lost weight and kept it off and got rid of Type II Diabetes in the process – I hope it helps you to feel confident that you can find what works for you in your life and make it happen – whatever it is you need to do! Oh I love that you posted this Dian. I hate my internet has been a hit and miss all day. I would love to share your post with my readers on Friday. I think they will love your words of wisdom. I will share something about myself. You know I am struggling and I have even added in the exercise because of my refusal to get rid of the carbs. With my height, my waist should be 30.5 inches. Well mine is not! I have been watching my measurements and as of 3 weeks ago, my waist is a whopping 39 inches. I am a work in progress so I’m okay with sharing and I share every Friday but I wanted to share here in case you have a reader saying awww naw no carbs, I dont want them to feel alone lol! Dian loves to laugh at me when we chat about my fear of a carb free life lol! You have done such a great job Dian and you truly remain a very big inspiration in my life. Even if you are a skinny heffa! Aww T, thanks – you have always been so supportive! I love you and have faith in you – I KNOW you can do it! I love watching your “Too Real” videos, too! They are honest and open and great!! First of all:Congratulations!! You look fantastic! Thanks for the tips. I learned some things I hadn’t really thought about before. Misty » Thanks so much! I am so thankful I have been able to keep it off, too! Jamie @ Roubinek Reality » Great! I am happy to hear that! Congrats on your weight loss Dian! As a carb lover myself its encouraging to read that it is possible to give them up once and for all to feel better. I hope I’m able to stick with it an make the lifestyle change as well. Marla Zickefoose » Thanks ! It has been a few years and I am alive and well – never thought I could do it without carbs but I honestly DO NOT miss it! I do make sure to go with what i CAN have and DO and not si much about what I CAN’T do or have. I love this!! I have struggled with my weight my whole life and I only starting losing weight when I sat down and figured out what would work for me, not anyone else. My weight loss journey was just like my life, eclectic, a little of this a little of that and suddenly I lost 50 lbs and have kept it off. Great post! Thanks!